Tax day isn’t fun for anyone, but in recent years, local and national businesses have taken advantage of the anti-holiday to offer specials and deals to help relieve stress. “We understand tax season is a stressful time for many, with most of us just looking forward to getting through it as quickly and painlessly as possible so we can return to our normal routines,” said Jessica Correa, Senior Vice President of Marketing at Planet Fitness, offering one of the best deals year. David Kaiser, Executive Vice President of Great American Cookies, agrees that the day can be a bit taxing on everyone. Even Chuck E. Cheese is offering discounts this year. “We know this can be a stressful time for families so we want give them the break they deserve,” said Ashley Zickefoose, chief marketing and concept officer at CEC Entertainment, Inc.
Below are some of the best discounts with links as some will require coupons. Most, if not all, Planet Fitness locations across the U.S. are offering anyone, regardless if they are a member or not, to come in and receive a complimentary HydroMassage at any time between now and April 21 with printed coupon. This week is also “Xfinity Watchathon Week” where Comcast is offering over 50 networks to view for free from today until April 21 including HBO, Showtime, Netflix and others for those with basic cable. Sometimes, getting rid of the excess paper clutter can be a huge relief as well and a couple of office supply stores are offering free document shredding this year. Office Depot/Office Max has the better offer providing five pounds of document shredding with a coupon that doesn’t expire until April 28. Staples is also offering a coupon for one pound of document shredding to be used by April 21. Hardee’s is giving away free sausage biscuit sandwiches on April 17 from 7:00-10:00 a.m. (just mention “made from scratch” to receive it), Hot Dog on a Stick is offering free original turkey or veggie dogs and Great American Cookies are giving out free Cookies & Cream cookies (one per customer) on April 17 as well while supplies last. 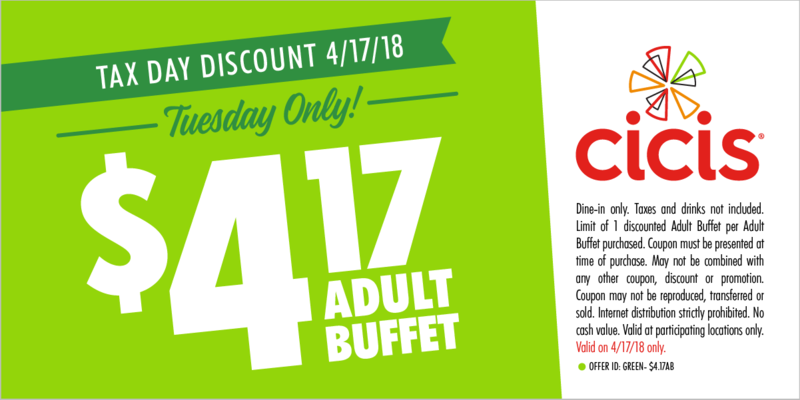 For every large pizza ordered at Chuck E. Cheese, families will receive another large cheese pizza free between April 17 and 19 while Cici Pizza which if offering a coupon for $4.17 adult buffet at their restaurants on April 17 only. Boston Market is offering their half chicken individual meal (with two sides and a fountain drink) for $10.40 and Farmer Boys is offering two breakfast burritos or two Bell Ringer double cheeseburgers for $10.40. Both offers are good on April 17 only and do not require a coupon. 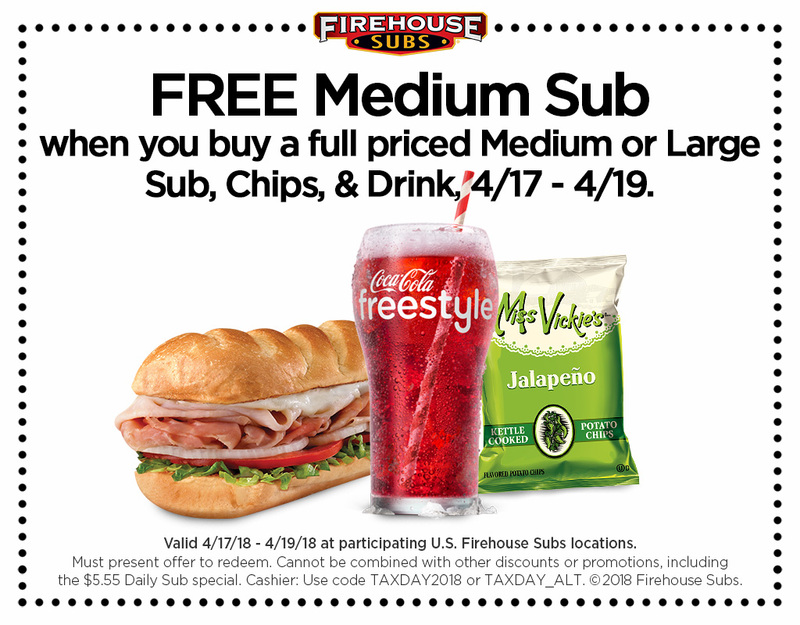 Firehouse Subs is offering a free medium sub with a purchase of another medium sub, chips, and medium drink from April 17-19 in honor of Tax Day. P.F. Chang’s is offering a 15 percent discount on all takeout and online orders using the promo code: “TAXDAY” on April 17 or you can use a coupon to receive a free appetizer with your dining purchase by texting “CRAVE” to 242647. Tony Roma’s is also offering free appetizers on April 17 as well. Use a coupon for a free Kickin’ Shrimp appetizer. Finally, Sonic Drive-in is offering half-price cheeseburgers while Sonny’s BBQ is offering half-priced rib dinners on April 17. See, Tax Day isn’t so bad after all.